As most of us know, contact lenses are the best alternative to glasses. They are small, plastic shaped discs that are made to correct eyesight problems like nearsightedness, astigmatism, farsightedness, and other problems. Contact lenses are also used by those who have had cataract surgery, as they can help the eyes to heal a bit faster. 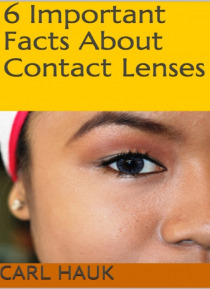 In this ebook, you'll find helpful tips on:-What Everybod… y Ought To Know About Contact Lenses-Strange Facts About Contact Lenses-How To Clean Hard Contacts-And MoreGRAB A COPY TODAY!